I love Grocery Outlet and their signs. It's been a while since I've posted anything they've created so this should satisfy your desire. One other time the posted a sign showing it was cheaper to go to another store than to buy the item from them. I don't know what was going through the person's head when they posted it but it got put up anyway. 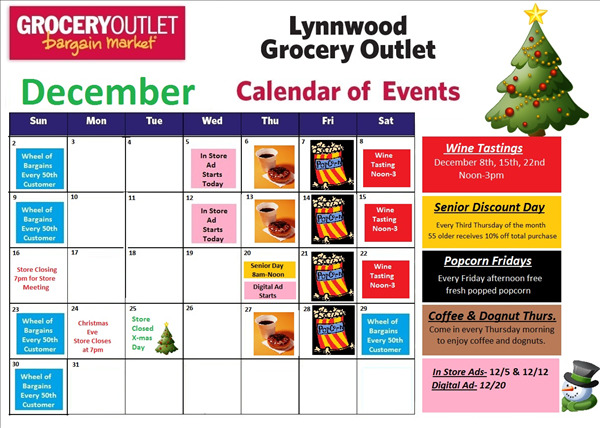 This is a calendar of events for a particular store... OK, it's the Lynnwood Grocery Outlet. I'm sure it's just a typo but I couldn't leave it alone because it's so funny. In the brown box on the right hand side of the calendar is Coffee and Dognut day. If you have an insatiable appetite for dog nuts be sure to show up at Lynnwood Grocery Outlet any Thursday morning. That's once a week or every seven day which to be honest is about as long as I can go without dognuts. By about Wednesday night my craving for Dognuts is damn near uncontrollable. I'm frothing at the mouth about Tuesday night and by Wednesday I'm going into withdrawals. Poor dogs, it's sad. If you however, have a craving for doughnuts you may want to check out your local doughnut store. I imagine you'd be able to find one listed under donuts as well.